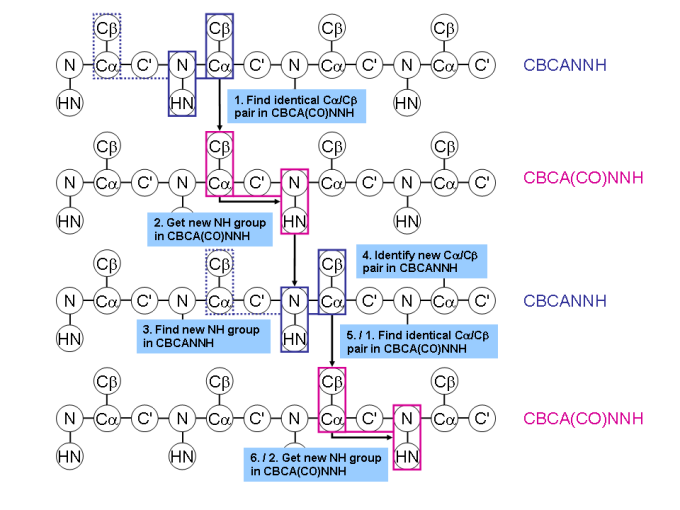 Standard triple resonance backbone assignment of proteins is based on the CBCANNH and CBCA(CO)NNH spectra. The idea is that the CBCANNH correlates each NH group with the Cα and Cβ chemical shifts of its own residue (strongly) and of the residue preceding (weakly). 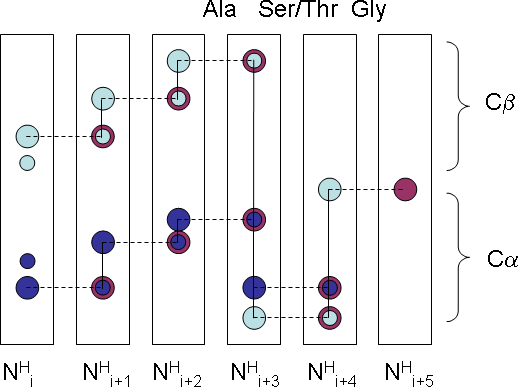 The CBCA(CO)NNH only correlates the NH group to the preceding Cα and Cβ chemical shifts. The Figure below shows how this can be used to link one NH group to the next into a long chain. The Cα and Cβ chemical shifts adopt values characteristic of the amino acid type. Some of these, such as Alanine, Serine, Threonine and Glycine are very easy to spot as their Cβ chemical shifts are very different to those of the other amino acids (and in the case of Glycine there is no Cβ). Valine, Isoleucine and Proline are also likely to stand out by the fact that they have lower than normal Cα chemical shifts. 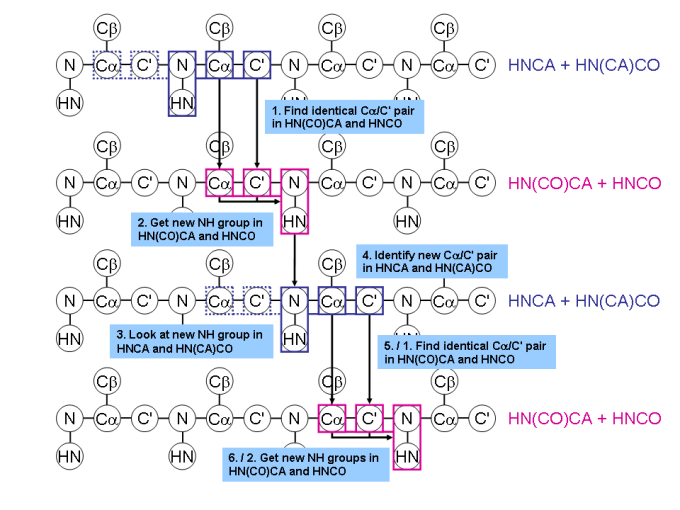 Once a chain of NH groups with their corresponding Cα and Cβ chemical shifts has been built, then the identification of some of the amino acid types makes it possible to match this string to the sequence. E.g. a string of shifts may have been found that corresponds to xxxSxxAx – if this sequence only appears once in the sequence of the protein in question, then sequence-specific assignment can be made. You may be surprised to find that I have coloured the Glycine Cα in light blue rather than dark blue – this is to illustrate the fact that Glycine Cα peaks may often have the same sign (i.e. be positive or negative) as the other Cβ peaks. Whether this really is the case, though. depends on the exact pulse sequence you use. The advantage of using the HNCO and HNCA-based spectra is that they are more sensitive than the CBCANNH-type and thus the spectral quality should improve. 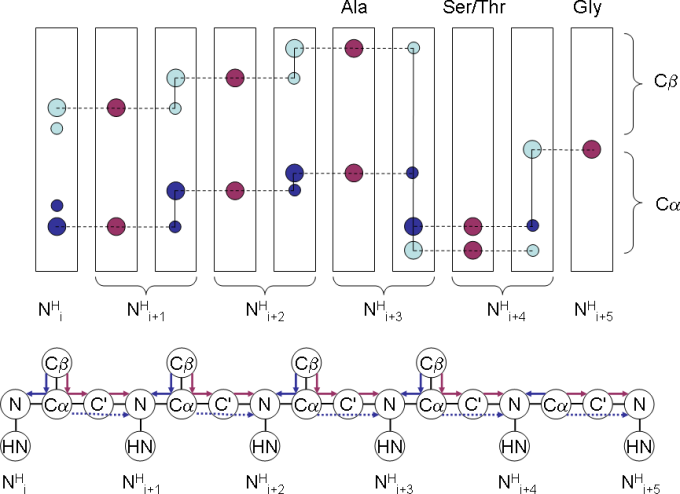 The disadvantage is that the Cα and C’ chemical shifts provide less information about the amino acid type than the Cβ chemical shift and are less disperse.